Badgers have no natural predators in the UK since bears and wolves became extinct from our islands. However, badgers do face many threats and all of them from Man. It is a sad fact that many thousands of badgers are killed each year. An estimated 10000 badgers are cruelly baited with dogs and dug out of their setts. Other badgers die in agony in snares, or are poisoned or shot, while over 50000 are killed on the roads. Many badgers lose their setts and vital feeding areas to building development. 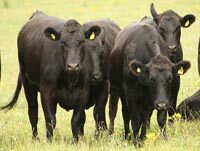 There are also calls to kill badgers in the mistaken belief that this will stop cattle being infected with bovine tuberculosis. Thousands of badgers are killed illegally each year, suffering terribly in the process. It is illegal to set a snare to catch a badger or to place one on a badger run/path. 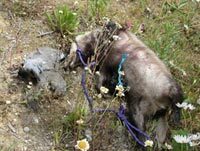 The image on the left shows a kind of home made noose in which this poor badger met its death. Whole setts are sometimes destroyed both intentionally and through ignorance. Badger Trust keeps a database of badger persecution and has a special recording form to monitor the problem. Poisoned eggs and other bait are sometimes laid for various 'vermin' and badgers have been known to eat these, resulting in a slow and painful death. About 10000 badgers die annually through baiting and digging. Badgers are dug from their setts and either killed on the spot or taken away to be attacked by dogs, when both badgers and dogs suffer horrific injuries. NEEBG works with the police and RSPCA to prevent and investigate such terrible crimes. Badgers are also killed and injured by ‘lamping’. A very bright light is used (usually attached to the roof of a vehicle) to dazzle and spotlight badgers out feeding at night. They are then shot or attacked by dogs. The images on the left illustrate one such incident in our area. We were called by the police to investigate the body of an adult badger in an arable field with a large wound to the underside of it's neck. As it transpired, this badger had been lamped along with one of it's cubs, the bodies of both lay some distance from each other. Four wheel drive tyre tracks were clearly visible all around the bodies and empty shotgun cartridges were present. The landowner was questioned by police but denied all knowledge. Many badgers are caught in snares that inflict terrible injuries as they tighten and cut into the flesh when the badger struggles to get free. Snares are indiscriminate and cause suffering and death to domestic animals as well as to wild ones. Snares are required by law to be inspected at least once every twenty four hours, and twice a day is preferable. 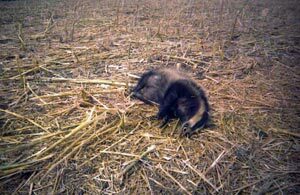 The horrific picture on the left is of a badger caught in a drag snare. In a vain attempt to escape the badger chewed at it's own feet. 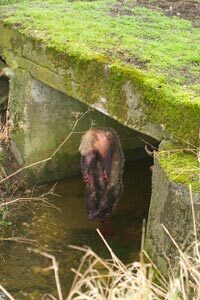 The badger went over the edge of the bridge and suffered appallingly. 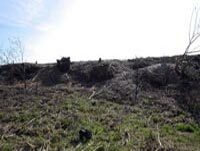 Sadly drag snares are still legal provided they are free running snares and they are not placed on a badger path or used in an attempt to catch a badger. Badger Trust campaigns for a ban on all snares. Contact them for a copy of the petition form. 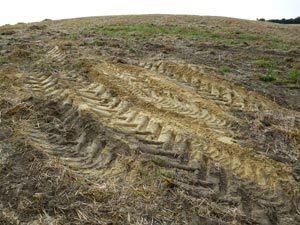 It is illegal to interfere with badger setts, but slurry and diesel are pumped into some setts to kill badgers or to drive them off. Some landowners use carbon monoxide from the exhausts of farm machinery pumped into setts via a pipe to kill badgers. The Hunting Act removed the right of Hunts to illegally block badger setts but some do still seem to block them. When setts are blocked with heavy materials badgers may be unable to dig themselves out and die underground. For over thirty years, tens of thousands of badgers have been killed in a vain attempt to control bovine TB. The calls to kill badgers continue in spite of compelling scientific evidence that most bovine TB is spread by cattle, not badgers.